Major sources for electromagnetic interference in a building are (single or three phase) power lines with unbalanced load, transformers, main distribution panels, risers and other electrical equipments like industrial furnaces, UPS. For some type Microscope applications, the very slow changes of magnetic field may deteriorate the performance. Sources like elevators, MRI, NMR or nearby subways, traffic might generate quasi static EMF. The most effective way to mitigate the EMI is to remove the source or improve building wiring (like identify and correct Net current in electrical circuits). Passive shielding or active canceling of EM Field for a certain area can be reconsidered, when source removing or wiring improvement seems it is not a feasible option. on tool size, room dimension and ambient field amplitude and its gradient, a suitable solution can be offered either as an external frame around the tool or as room size Helmholtz cage. One of the main factors in getting high cancelation performance is the compensation controller. 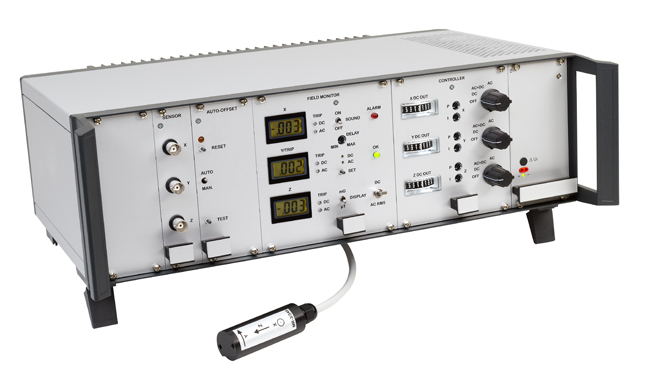 MR-3 controller of Stefan Mayer Instruments achieved excellent 40dB (100x) attenuation of magnetic field.